Am Donnerstag, 19. November 2015 wird die neue Cinema Stage des Babelsberger Postproduktionshauses Rotor Film offiziell eröffnet. Brandenburgs Wirtschaftsminister Albrecht Gerber, der Vorstandsvorsitzende der Studio Babelsberg AG, Dr. Carl Woebcken und Medienboard Berlin-Brandenburg-Geschäftsführerin Kirsten Niehuus begrüßen gemeinsam mit den Rotor Film-Geschäftsführern Holger Lehmann und Martin Frühmorgen die geladenen Gäste in der neuen Cinema Stage auf dem Gelände der Medienstadt Babelsberg. Ausstattung Ton: Tonmischung und Wiedergabe in den Tonformaten Dolby Atmos, Auro-3D®, AuroMax® und anderen SMPTE-kompatiblen 3D-Tonformaten mit Umschaltung zwischen den Formaten. Chennai, India, 16 April 2015 – Digital cinema leader Barco and US-based digital cinema server manufacturer Qube Cinema have reached an agreement on the integration of the ‘Auro 11.1 by Barco’ decoder in Qube’s integrated media blocks (IMB). This decision is a major step forward for both companies, ensuring a smooth upgrade to the Barco Auro 11.1 immersive sound system for theater owners and cinema chains. Qube Cinema – a subsidiary of India-based cinema technology leader Real Image Technologies – manufactures digital cinema servers for commercial and institutional cinemas worldwide. Qube server is the leading server in India on the Digital Cinema platform. New Delhi, India, 12 November, 2014 – Digital cinema leader Barco is proud to announce the first completed installation in New Delhi of its Auro 11.1 by Barco immersive sound technology. Place of implementation is the PVR multiplex in the Pacific Mall, Tagore Garden; one of the busiest places in India’s capital. The project also marks the first installation of the Auro 11.1 technology in the North of the country. With 1,116 seats and six screens, the PVR multiplex in the Pacific Mall is one of the most popular destinations for movie aficionados in New Delhi. With 454 screens, 102 properties in 43 cities, PVR Cinemas is India’s largest cinema exhibition company. To strengthen the popular multiplex’s reputation and help differentiate it from local competition, PVR Cinemas decided to equip the theater with ‘Auro 11.1 by Barco’ immersive sound technology in Auditorium 4 of PVR Pacific Mall, Subhash Nagar, New Delhi. This unique speaker layout, based on three axes (width, depth and height) reproduces a stunning sound experience, in which sounds are truly coming from all around and above. The result is true-to-life sound reproduction, enabling the audience to position sound sources correctly in space without the need for more expensive solutions requiring extremely high channel counts and more amplification. Mol, Belgium, 13 October 2014 – Soundideaz Studios, promoted by noted sound engineer Pramod Chandorkar, have recently installed the next generation Auro-3D® Studio System. Kothamangalam, Kerala, India 26 April, 2014 – Barco, a global leader in digital cinema technology is pleased to announce that the Ann Cinema complex in Kothamangalam will enter a new cinematic era, this Saturday. With the inauguration of their 2nd brand-new theater equipped with Auro 11.1 by Barco immersive cinema sound, EVM Group looks to awe spectators with fully immersive sound sensation. The installation follows EVM Group’s earlier positive experiences with Auro 11.1 by Barco’s sound technology at Ann Cinemas. Mumbai, India 25 April, 2014 – Barco, a global leader in cinema technology, is pleased to announce that Kulraj Broadway the first ‘Auro 11.1 by Barco speaker layout in Mumbai will open its doors for public to have mesmerizing experience of the sound inside the hall. Famous Indian movie director Subhash Ghai—who’s upcoming movie Kaanchi is also the first Bollywood movie mixed in the Auro 11.1 by Barco’s immersive sound format – will be screened at Kulraj Broadway, resulting in unforgettable experience for the audience. As Mumbai is the central hub for the Indian cinema industry and Bollywood in particular, the news marks a major achievement for leading technology provider Barco and the Auro 11.1 sound format (…). Rancho Cordova, Calif., USA – 26 March 2014 – Barco, the worldwide market share leader in digital cinema, further expands its footprint of the Auro 11.1 immersive cinema sound solution, with current installations at over 150 screens around the world and another 300 committed for deployment in 2014, while adding a powerful slate of upcoming summer blockbusters. To date, exhibitors have signed agreements with Barco to install more than 300 additional screens with Auro 11.1 in their cinemas – on top of the 150 auditoriums already featuring Auro 11.1 – with the goal of elevating the moviegoing experience in their premium auditoriums. 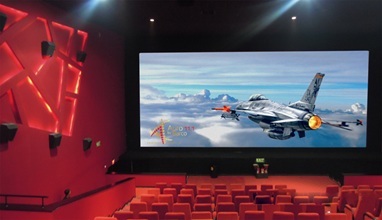 In fact, due to the economic advantages of Barco’s immersive sound solution, leading exhibitors worldwide are embracing Auro 11.1 as their preferred sound format in markets such as The United States, Latin America, Switzerland, Austria, Taiwan, Estonia, and many others, allowing them to add value to their own specific brand of premium cinema experience. Auro 11.1 is a critical component of Barco’s recently introduced CinemaBarco, dramatically enhancing the showmanship and immersive qualities of the movie for audiences, who will soon embark on a new entertainment journey in cinema for a true destination experience. 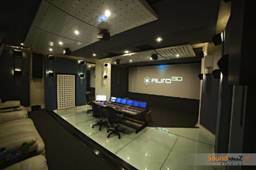 Chennai, India, 14 March 2014 – Renowned Indian post production house Trinity Digi—owned by sound engineer J Prakash—has recently installed the Auro-3D® Studio System. Following in the footsteps of famous Indian studios like AM Studios and Ramanaidu Studios, Trinity can now mix the latest Tamil movies in Auro 11.1 by Barco or any of the other immersive Auro-3D® formats. So far, Mr. A S Lakshminarayan and his team have already mixed the successful 2014 thriller Jilla (R. T. Neason), Aarambham directed by Vishnuvardhan, Vizhi Moodi Yosithaal directed by KG Senthil Kumar and the much-anticipated historical drama Ramanujan, directed by Gnana Rajasekaran, in Auro-3D®. Additional Tamil movies will be mixed in the format over the upcoming months, making them ready for screening in theaters equipped with the Auro 11.1 by Barco sound system. Chennai, India, 26 February, 2014 – Auro 11.1, the revolutionary sound installation by visualization solution leader Barco, continues its rise in India’s thriving cinema industry. Anu Ega, one of the theatres in the EGA Cinema multiplex in Chennai City also chose to engage with its audience in natural, immersive sound.